This new edition was recognized as a highly commended title by the British Medical Association at the 2017 BMA Medical Book Awards. Regarded by both students and instructors, Principles of Pharmacology: The Pathophysiologic Basis of Drug Therapy, 4th Edition, offers an integrated mechanism-based and systems-based approach to contemporary pharmacology and drug development. An easy-to-follow format helps first- and second-year students grasp challenging concepts quickly and efficiently. 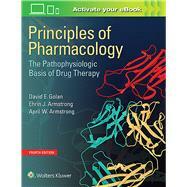 Each chapter presents a clinical vignette illustrating a therapeutic problem within a physiologic or biochemical system; followed by a discussion of the biochemistry, physiology, and pathophysiology of the system; and concluding with a presentation of the pharmacology of the drugs and drug classes that activate or inhibit the system by interacting with specific molecular and cellular targets. Chapters are integrated into sections that focus on organ systems and therapeutic areas of highest importance. Clear, concise illustrations highlight key points, and drug summary tables offer quick access to essential information.